This was one of those dishes where I really couldn’t be arsed to cook anything. I was sat, lounging about with little or no enthusiasm. After a quick inspection of the freezer, I was reminded that the sausage quota was at an all time high due to another win at the local meat raffle. I keep winning the cheap sausage tray! It was absolutely delicious. Use good quality sausages and who knows what magic you could achieve?! Heat a large pan with the olive oil over a moderate heat. Fry all the sausages and chorizo until browned on all sides. Remove from the pan. Add the onions, celery and garlic and fry gently for 6-7 minutes until soft. Turn up the heat and add the paprika, tarragon and bay leaf – stir briefly then add the red wine. Sizzle for 30 seconds then add the passata and stock and sugar. 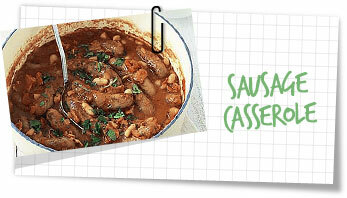 Bring to a simmer then return the sausages and chorizo to the pan. Season well with salt & pepper and bring to a gentle simmer. Reduce the heat to low and simmer for 25 minutes. Stir in the fresh parsley then serve. Serve with fresh crusty bread or with mashed potatoes.